House at the end of the Street Blu-ray Review House At The End Of The Street is a little gem of a film which is a pleasant surprise. There is nothing better than getting more than you think you are going to get out of a thriller. Mark Tonderai’s latest film, House At The End Of The Street takes off intriguing enough, slows down with hints of a predictable ending and then takes off on a path that Hitchcock himself would be proud of. Elissa (Jennifer Lawrence) and her mother, Sarah (Elisabeth Shue) move to a small town where they have found a beautiful house to rent which should be out of their price range. However, the fact that their house is next door to where a young, disturbed girl murdered her parents years ago makes the house much more affordable. Elissa befriends Ryan (Max Thieriot), the reclusive brother of the murderous daughter, Carrie- Anne, who has been missing for years and is rumoured to be living in the woods near their houses. Ryan has always seems mysterious to the town people and his mystery attracts Elissa, but Ryan has more secrets than anyone ever thought possible. 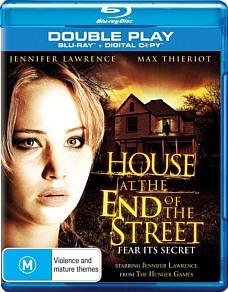 House At The End Of The Street is the type of thriller/horror film that you really want to see. A film where you really do believe you have the ending figured out and that you have been so clever as to guess what the twist could be, but you really have no idea. The script is so brilliantly written that in the last few minutes you are still trying to figure it all out and at the end of the film, all finally comes together and you leave feeling like all your questions have been answered. The story is very original with a scent of Hitchcock script. Even though the film is not completely scary, it is still quite suspenseful. Another good thing about this film is that it doesn’t rely on blood, guts and gore to get its point across. The scariest image is of Carrie-Anne at the beginning as madness overtakes her and she makes her way towards her parents room. She does tend to channel Samara from The Ring visually a fair bit. This is a different choice of role by Jennifer Lawrence, but she again makes it work for her. She is very much your no nonsense type of girl who will do all she can for those in need, but would prefer trouble not to follow her around. Max Thieriot is also very good and attains the audiences sympathy very quickly. The special features are few in number and include English subtitles and a behind the scenes featurette called “Journey Into Terror: Inside The House At The End Of The Street”. Although the featurette is a little on the brief side and doesn’t go too in depth into the production of the film, but is still enjoyable nevertheless. House At The End Of The Street is a little gem of a film which is a pleasant surprise. There is nothing better than getting more than you think you are going to get out of a thriller.